Watching Last cough up his wine wasn’t the only reason for Tolyat’s declaration, but he had to admit that was part of the appeal. The man was a guide, and had seen so much, experienced so much, gone so many places, that it was hard to crack his shell of burnt-out weariness. One pretty much had to say something so outrageous it should never be uttered by a sane man. Driftwood is, as its description might suggest, a setting that tends toward the depressing. But I can only write so many stories about OH MY GOD THE WORLD HAS ENDED before I need a change of pace. So I give you: a cheerful Driftwood story! One that’s even funny in places. 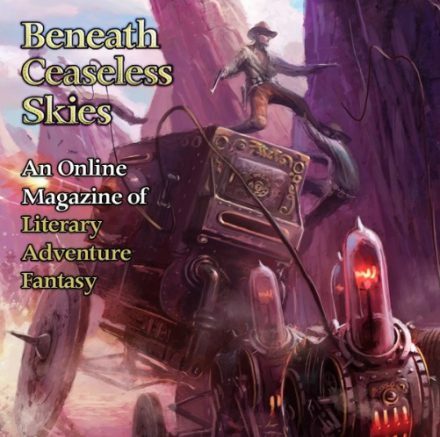 It appeared in issue #104 of Beneath Ceaseless Skies in both text and audio forms, and it was also recorded by Podcastle.